Three months after being selected to join The Walt Disney Company’s coveted Accelerator program, Savioke’s CEO Steve Cousins, took the stage at the Disney Studios in Burbank to share the projects, pilots, and collaborations underway with Disney partners and brands. As part of the 2017 Disney Accelerator, Savioke and 10 other innovative startups connect with the creativity, imagination and expertise of The Walt Disney Company, which provides unprecedented access to its leadership team, mentorship, and support. The Accelerator program culminates today with “Demo Day” where CEOs present their companies and give details on plans and collaborations with Disney. The Walt Disney Company concluded the 2017 Disney Accelerator program today by hosting its fourth annual Demo Day. At the event, the eleven participating companies presented their businesses to investors, Disney executives and other industry leaders. Robots have been hard at work, helping us in our factories and warehouses since the 1960s. Nowhere have robots made a bigger impact than the automobile industry where giant industrial robots, kept far away from people, have made huge improvements in quality, productivity, and safety. Welcome to the next generation of robotics. This is the generation where robots come out of the factories to work alongside us. I’m Steve Cousins, founder and CEO of Savioke, the pioneer in service robotics. We create robots that help people… and make them smile. Since 2014, Relay has been working with hotel staff to surprise and delight guests all around the world. Relay is reliable, easy to use, and completely autonomous. He even uses the elevator all by himself. Most important, Relay is safe around people -- and not just workers in steel-toed boots. Relay gracefully navigates through dynamic environments, avoiding all obstacles and people in his way. He is especially gentle and safe around children who often want to hug him or chase him through the hallways. In fact, the first time we installed Relay in a hotel, we saw a three year old’s bare feet through the robot’s eyes. That’s the safety case we designed Relay for. It’s Savioke’s combination of award-winning design, proprietary technology, and innovative engineering that makes this a reality. Today, Relay is in nearly 70 locations in the US, Europe, and Asia including all the major hotel brands. Beyond hotels, Relay is working in logistics centers, bringing tools and parts to technicians, and will be in hospitals next month, delivering medications to patients and nurses. Yes, Relay is giving us superpowers to be more productive, but the real magic is his character. It’s Relay’s charm, politeness, and honesty that makes him a beloved teammate rather than just a functional appliance. That’s why working with Disney is a dream come true. And why we are thrilled to announce that Walt Disney World resorts is starting a pilot with Relay in a hotel at Walt Disney World Resort. 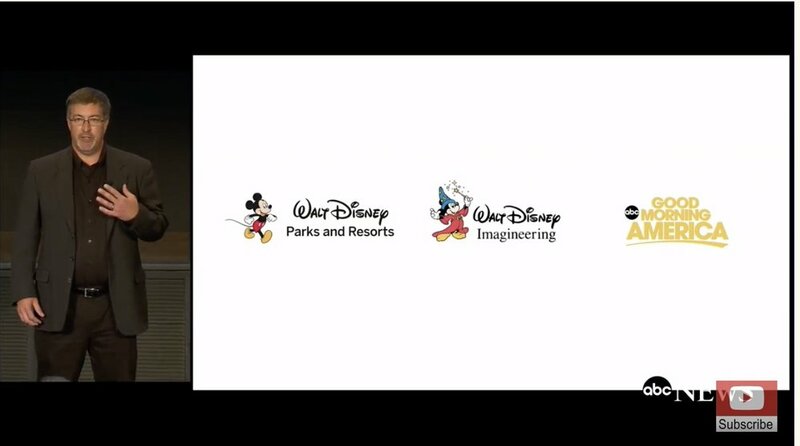 We are also exploring opportunities for collaboration with Walt Disney Imagineering. Additionally, Good Morning America is planning to test Relay as part of their team, delivering coffee, scripts, and surprises to the hosts and celebrities. As you can see, Relay will soon be a very busy bot. But no matter how famous Relay becomes, his mission will always be to help people help themselves. Now, with the support and inspiration of Disney, Relay can go beyond our imagination… because dreams really can come true. Savioke’s Bob Bauer, Steve Cousins, and Lauren Schechtman take a break from Demo Day rehearsals to visit the Happiest Place on Earth.